Gregory Butler, pianist from Belleville, Ontario, began his piano studies at the age of five with Leona Riggs and at ten joined the studio of renowned Toronto pedagogue, Mona Bates. Following high school, Butler attended the Eastman School of Music of the University of Rochester from which he graduated with a Doctor of Musical Arts in Performance and Literature in 1974. While there, he studied with Jose Echaniz and Eugene List. His doctoral dissertation explores the Five Piano Sonatas of Canadian composer, Harry Somers. Butler’s playing, which has won him many Canada Council Grants and numerous Canadian and American competitions, has taken him to every major city in Canada and many in the United States, including an appearance at the White House. Of significance, were successful debut recitals in Carnegie Recital Hall, New York and Wigmore Hall, London, England. These concerts presented the American and British premiers of Harry Somers’ Third Piano Sonata. Throughout his performing career Gregory Butler has been dedicated to the performance of Canadian piano literature, always including representative works in his solo concerts. His 1988 recording of the Complete Solo Piano Music of Court Stone is but a small reflection of this commitment. Over the last twenty-five years, Gregory Butler has performed many duo-piano recitals with esteemed organist, friend and colleague, David Palmer. In their latest collaboration, the first to involve organ and piano, the critic declared them a “dynamic duo” and Butler a “master pianist.” “Butler and Palmer Shine,” continued the commentary with “…such incredible talent, such simple beauty.” In June, 2008, David Palmer and Gregory Butler released their first CD of organ and piano works, Double Exposure. Dr. Butler has held teaching positions at Mount Allison University, the Eastman School of Music and MacMurray College in Jacksonville, Illinois. 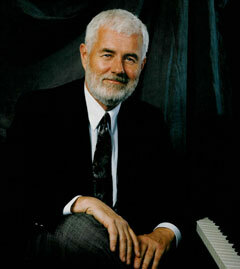 From July 1, 1986 through June 30, 1998, Dr. Butler was Director of the School of Music at the University of Windsor. Dr. Butler retired from the University of Windsor honoured with the rank of Professor Emeritus and currently maintains his association with the School of Music as a Special Instructor in Piano. He presently teaches from his studio in Russell Woods in Tecumseh, ON, and can be contacted through his website, www.butlerpianostudio.com. Dr. Butler is Past-President of the Windsor-Essex ORMTA Branch, second Vice-President of the Canadian Music Festival Adjudicators’ Association and a member of the Windsor Branch of the American Federation of Musicians.